Every year one thing we religiously try to do - visit a winter festival. Having immigrated from South East Asia, we are sucker for warmer weather and as soon as the air starts to chill in this part of the world with the approach of winter we quickly coil into a shell and rarely peek out of that unless and until something really pressing happens. I personally am not by any means much into adventure, and mind it to us skiing is no less scary than rock climbing. The kids love snow so every now and then we put on our heaviest cloths and knee long boots and reluctantly accompany them outside into the snow. Sometimes, when the temperature is not too low and the annoying wind chill is not hovering in the deep negativity we even enjoy the experience. But that rarely happens. Nevertheless, traditions are made, somehow. And it was one of our traditions to visit a winter festival every year. Over the years we went to Ottawa, Cobourg, Ajax, Sault St. Marie (the famous Bon Soo) and some other minor ones. This year we decided to check out the Barrie Winterfest. It was quite apparent from the beginning that Barrie wasn't anywhere near as big as the Ottawa or Bon Soo festivals but then we wanted it to be just a one day visit. From GTA it was only about an hour long drive provided the traffic was acceptable and no accidents took place in the dreaded Hwy 400. 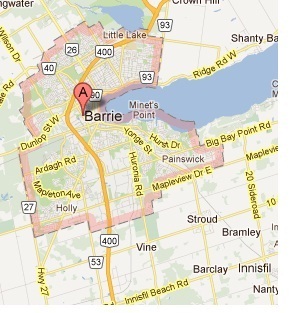 On February 4th Saturday we drove to Barrie. The drive went very well. We were there by 11 AM. The Winterfest took place in the Heritage Park right next to almost frozen Lake Simcoe. The festival it self wasn't very grandiose in look and feel and activities but the thousands of people who gathered there to celebrate it made the real difference. It did feel like a festival. The temperature were hovering just around zero degree Centigrade but as the location was near the lake it felt much colder than that. My finger tips and toes lost most of the feelings by the time we were just half an hour into our excursion through the park. Kids usually like the tall icy slides. Here there was a short one , nothing in comparison to what we have seen in Ottawa and Bon Soo but I guess we weren't expecting much either. The sorry part was that even this small slide was so rough that most could slide only a few feet before halting in a total stop. The adults could care less but the kids grunted all the way to home. Horse cart. We ended up not taking it. There was a helicopter offering ride for CAD 45/person. None from our group went any near than what can be seen in this picture. They did like the small frozen water body inside the park where everybody skidded and rolled. Even the adults had some safe adventure walking on the thick frozen ice. The kids also liked the big rolling balls. There was a carnival that hooked itself at the end of the Winterfest. They had several rides, relatively expensive at almost 4-5 dollars per person for each ride, but the kids seemed to like them. We stayed in the festival for about couple of hours before everybody was cold and wanted to retreat. Later we visited the Pizza hut located on Bayfield road and had quite a party with about 20 people in the group. The mini roller coaster. Young girls loved it. The spinner. The preteens found something to talk about after this ride. We returned to GTA only to gather in one of our friend's house and party until it was early morning. Overall, for a days outing, it wasn't all that bad. The kids didn't particularly find the Winterfest that enjoyable but hey they rarely finds anything interesting any more. A respected arrears nonprofit can possibly expect the numerous many people investing in individuals intended for guide above payday cash advance credit card debts to help you twice this approach. bill aid organization reveals approximately buy a short-run, excessive interest loans this current year. The particular charity states that 36 months before the volume of consumers with them was initially trivial.